Someone is in big trouble around here. I found granola bar crumbs all over the floor of my brand-new minivan. Hello? Can't we even go 2 weeks around here without defiling our expensive new purchase? I think whoever committed this crime needs to donate his/her college fund towards the car payment. Larry thinks that's too harsh. I'll bet you he's the one who did it. The possibilities are endless - feel free to contribute your own ideas in the comments! Knitting not only relaxes the mind, it can also do strange things to the space-time continuum. If you will recall, I started this baby surprise jacket almost 3 weeks ago. You see, I'm doing a sort of knit-along (sort of, because everyone else did it last year sometime) for the BSJ: someone rewrote the instructions and divvied it up so that it would take only 12 d ays to finish the jacket. My friend who participated in the knit-along sent me the instructions (and all you copyright fiends, don't worry - I do own the original pattern, I just couldn't make head nor tail of it, all right?). Anyway, I started on this 12-day project, oh, 20 days ago. I just finished Day 4. Meaning, I've got 40 days to go - sort of like the ancient Hebrews wandering in the desert for 40 years, only shorter, and with some cheerfully-colored Lion Brand CottonEase. I don't know how they managed all that time without CottonEase. Oh, joy! Larry has agreed to designate this coming weekend as a "let's get rid of/organize/hide all the extra crap in the house" extravaganza. Isn't he nice? Of course, it may have had something to do with my suggesting arson as a reasonable way to tackle the growing mounds of paper and junk that are threatening to engulf us. Or maybe he just hates to see me cry. He's nice like that. Ta-da! Fridge pictures! Thank you, RobinH! I had no idea that by taking the little card thingie out of my camera and sticking it in that other thingie on the computer, I could make my pictures magically appear on my screen. I had a bad moment there when I couldn't figure out how to find them again to put them on my blog, but hey! Here they are! Please note the empty bottle of apple juice standing by itself in the center of the picture. Because what could make more sense than putting a complete empty container back in the fridge? Rinsing it out, maybe? Naaah, let Mom do it. It sort of bugs me. And can anyone tell me what the container on the top left has in it? I have no flippin' idea, so any and all suggestions will be considered. Those fingerling potatoes on the bottom left are from St. Patrick's Day - how fitting, considering they are turning sort of green at this point. The middle container on the right is a rare sight - uneaten IKEA meatballs with pasta. I blame Lent. The coleslaw on the bottom right? No excuse. Empty! Half-full! Full! This is an artistic representation of the arc of life, using the strikingly original medium of applesauce. The fullness of youth, with its limitless horizons, give way to the diminishing expectations of middle age and then the empty moldiness of decrepitude. I give it A+ for laziness. I mean, c'mon, how hard is it to check for an already open jar before you open a new one? This piece is titled "The Futility Of Ketchup." The bottle on the left perfectly captures the angst inherent in all human endeavors. This message is thrown into stark contrast by the bottle on the right, with its intimations of hope and more ketchup. It is also reminiscent of Carly Simon and "Anticipation." But maybe that's just me. And, of course, a "Meditation On Salsa." We have long experimented with using salsa to represent our deepest yearnings and aspirations. But only recently has our work presented such a variety of influences, ranging from Mild to Thick 'n Chunky to Organic. Only when faced with the infinite variety of the salsa experience are we able to appreciate our all-too-human limitations. My tech support (aka Larry) is attempting to fix my photo downloading problem. Isn't he nice? I couldn't get to it today, what with important things to do such as haircuts for the boys and an afternoon nap for me so that I wouldn't kill anyone. The nap was counterproductive, however; I managed to have a nightmare (I know! In the daytime!). I dreamed that I had a cute little 2-year-old boy who I had totally forgotten about and hadn't hugged in a year. Let's not analyze that one, okay? So, I woke up feeling awful and staggered downstairs to count my kids (no 2-year-olds, I checked) and start some dinner. And here's where something good happened. I found a whole bag of fresh(?) brussels sprouts that I had bought over 2 weeks ago, and they were still okay. So I managed to feel like a good mom feeding my children fresh green vegetables for dinner. Whew. Does anyone live on a guilt rollercoaster like this? You'd think, after 17 years, I'd be past all that good mom/bad mom nonsense; but apparently not. Oh, joy! Theo has been accepted to two state universities. The relief in this household is palpable. Being the oldest, he has always borne the brunt of our angst. We worried about everything with him - I'm thinking he logged more doctor visits then all his younger siblings combined. We worried about his learning to share, his learning to read, his learning to make friends. Pity the oldest child...it's a miracle any of them grow up to be normal. The next 5? I probably won't even notice the college application process. Well, I've been stalling in the vain hope that Larry would have figured out how to get my photos onto the computer; but it looks as if I'll have to give up for tonight. Let's see, we've de-installed and reloaded the software (Kodak EasyShare), we've restarted the computer, and I've jiggled the camera when the download gets hung up. I think we are out of tricks. Ideas? Of course, I could just purchase a new camera, one that uses different software. Unfortunately, Larry nixed that idea; he seems to think that we have already done enough for the economy. If you lose your job next week, blame him. As The Food Turns - Not! Well - I really have nothing else to talk about today. Oh! Except that the woman who I accused of making me feel pathetic was kind enough to comment on yesterday's post. And it turns out that English is her second language, for heaven's sake. Don't I feel bad for calling her out on what she said? Thanks, TL, for bothering to join the discussion; I was just trying to reassure myself that not everyone was feeling sorry for me. Sheesh - now I really do look pathetic. Okay, so I can't get the photos (and it's a real shame, because I was going to show you all the special collections we have in the refrigerator right now); so maybe you all could just enjoy this video that Barb linked to in her post today? It's funny. My favorite line is "So the speed of light isn't fast enough for you?" Go! Click on it! Have fun! Don't fret about the fact that I will be chained to this computer for the next 5 hours trying to transfer my photos - I'll be fine, really. "Yeah, my freezer at home is full, too." Okay, I know it's not a good idea (impolite, even!) to listen in on someone else's conversation; but I think I unwittingly did the blogosphere version of that. I visited the blog of someone who linked to me this month, and in the comments someone mentioned that she reads my blog too, and that she feels sorry for me. So now I feel downright pathetic. ...many mothers now routinely use technology and social networking as well as coding their own websites, texting their babysitters, installing wireless routers, blogging and using Facebook. Really?!? But isn't that too hard? I mean, how do these women figure out how to use all those...those...buttons? You know, the ones with the letters on them? ...being a mother is a "thankless, horrible, awful job that nobody should actually have to do for free - but we do. So blogging is our outlet." Did they catch that woman on a bad day, or what? ...because I am going to sit in the passenger seat and knit. ...this meaning ample room on the passenger side door for both a work in progress and the Yarn Harlot's all-important instructions on how to turn a heel (I always forget) and kitchener the toe (ditto). 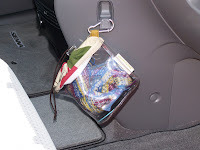 room for yet another project...the handy purse hanger being perfect for holding my little sock-knitting bag. ...the convenient and spacious storage contained within the passenger-side armrest! Never again - half an hour into a 3-hour car trip - will I find myself lacking a needle gauge, spare DPN, or frequently needed tape measure. Oh, joy! I do not understand why Toyota fails to emphasize these all-important features in their advertising campaigns. They have apparently not yet discovered the influential car-buyers-who-knit demographic. Hey, Toyota! Wake up! A friend of mine's mother passed on last Thursday, so my friend was at the funeral home the next day making some arrangements. There was one woman working with her who was very rushed and brusque. "Sorry!" she said, by way of excusing herself. "The past couple of weeks have been so busy here! So many people dying!" My grieving friend was at a loss with how to respond to this rather inane (if not downright insensitive) statement. I'm thinking a vague "So, business is good, then?" would have sounded a tad too callous for this particular situation. And I doubt my friend was capable at that point of mustering a cheery "Well, nothing's certain but death and taxes!" as an answer. We've narrowed down our car search, and a purchase is imminent. 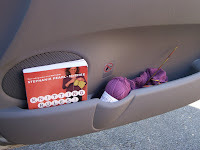 So imagine my dismay when I read this post of the Yarn Harlot's today and realized that I never once thought of checking out the yarn-holding capacity of the inside passenger door. 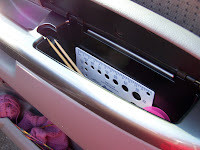 Here I was, obsessed with inconsequential details - you know, minutiae such as having enough seating for our 6 kids and being able to adjust the driver's seat so I can see the road; and all the while I forgot the importance of knitting supplies storage. And no wonder - why, this issue is not even addressed in those shiny brochures they give you at the dealership. I just checked. Okay, the stress of new-car buying has pushed Larry over the edge. After manning the phones all day, I warned him when he got home, "There will be a few car salesmen calling you tonight." "You mean," he said (or, rather, intoned), "I will be called by 3 spirits? Like, the salesman of Honda past and the salesman of Toyota future?" I am so worried about that man. The fridge post has gone missing. I know, I know....this Saturday, I promise! The expired leftover situation isn't too serious, however; we've had a couple of the neighbor girls over to dinner the last few evenings, which has helped cut down on wasted food. Maybe that's what people mean when they say "More is less." No, wait - that's "Less is more." Never mind. A friend had a movie night at her house this evening, and we all watched Fireproof. The acting left quite a bit to be desired, but I still liked it. In my book, any movie with firemen in it is worth watching. I just wasted 15 minutes searching unsuccessfully for a yummy picture of some hunk-y firemen. You know, Google - "yummy" doesn't mean naked. Couldn't they suffer some pretty serious burns fighting a fire that way? You may recall that several months ago, Larry expressed discomfort with my habit of knitting while he talked. I claimed that I pay better attention to him when I am knitting than when I am giving him my undivided attention, but he did not believe me. This disagreement was never resolved. Well, I believe that we should just look at the scientific evidence. Recent studies have shown that people who doodle while listening to someone speak retain more than the people who only listen. Meaning, they are paying more attention, not less, than all those sycophant-type listeners who make eye contact with the speaker the entire time. In other words, I'm right! He's wrong! Ha, ha, ha, ha, ha! Vindication is sweet. Now, hand me that knitting bag, will ya? Susie (not yet 4) likes to play UNO. Likes, as in, someone has to be playing with her at all times throughout the day or risk her vehement UNO-less displeasure. So we've been taking it in shifts. At least she's not obsessed with something complicated, like chess. I hate chess. I mean, games are supposed to be fun, aren't they? You have to think to play chess. So I won't complain about the mandatory UNO. After all, it could be worse - Susie could be amusing herself by decapitating stuffed animals. 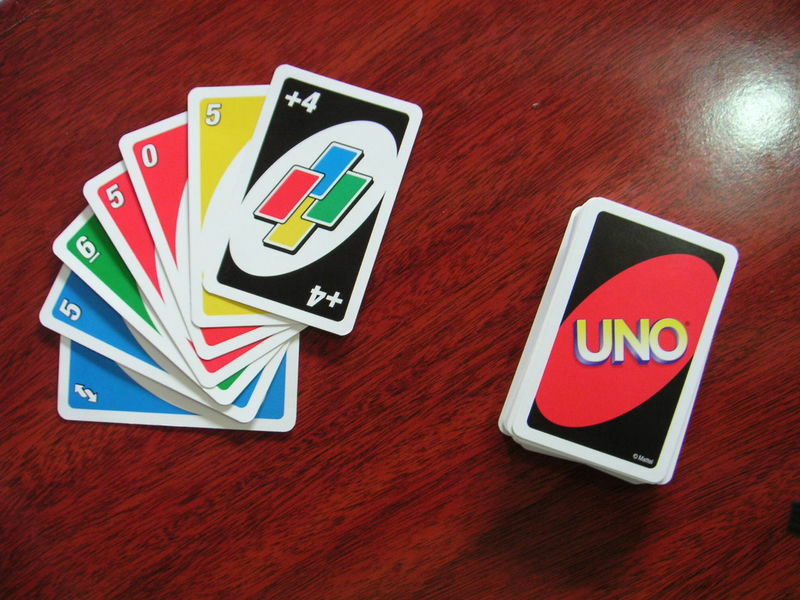 UNO is far less frightening. Rachel has conquered the art of skipping rope. She went at it with the same singleness of purpose and determination that she displayed when learning to ride a bike, or stuff a toilet, or disable the motion sensor we placed in her room to monitor her whereabouts a couple of years ago. (Not that that thing stopped her from stealing and eating the raw hotdogs in the fridge, but we had to try something.) She has a certain drive, shall we say, for success. Let us all hope she chooses to use this drive for good and not for evil. Because, Lord knows, we have absolutely zero influence over that child's behavior. So. Anna lost her coat last week. At least, we realized last week (when the temps plunged again) that it was missing. "I can't find my coat," she said. "And it has my bus pass in it. Can I have a dollar?" "Did you leave it at ensemble rehearsal? Laser tag? Youth group?" I went down the rather long list of possible places. "No, no, no....and I've looked everywhere!" Mothers of teen girls will recognize that the above conversation has not only been abbreviated for less painful reading, but also was repeated numerous times over 3 or 4 days. The coat was gone. Vaporized. No longer existent. That happens, you know. Why are you bothering me about it? Several days later I entered her room (scary, I know, but I'm a brave woman) to get some pillow cases out of the bag of sheets in her closet (pillow cases, by the way, that she swore were not there - are we detecting a pattern yet?). I opened the door and spotted the missing coat on the floor of the closet. Preferring to be optimistic, I said, "Oh, hey, you never told me you found your coat!" And she said, "I didn't find it." Meaning, when she looked everywhere, that did not include her own closet. So tell me, when exactly is the uterine locating device activated in a female? What's a woman to do? In situations like the above, I find myself turning to my comfort knitting. We all have our comfort foods - mac and cheese, cinnamon toast, whatever - foods we can count on to make us feel good and not challenge our taste buds. Well, knitters have their comfort knitting - easy, soft, dependable. Mine is the mistake-rib scarf - row upon endless row of fluffy, puffy knit 2, purl 2 - nothing to count, really, nothing to add or subtract. Reassuringly simple and soothing, it takes the rough edges off most any day with teens or toddlers. 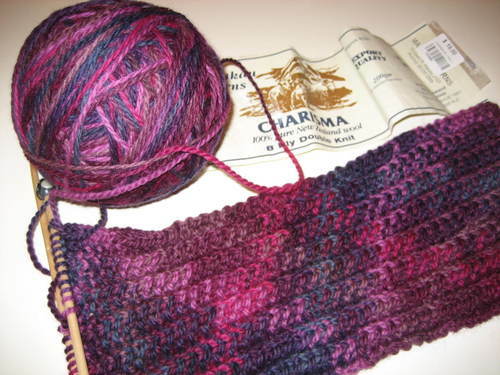 Readers who knit - what's your comfort knitting? Well! Car-shopping has impeded my ability to post here - who knew that destroying our last gasping remnants of personal financial security could be so time-consuming? Not me. Our marriage is surviving this ordeal, but barely. What with quarreling over how to act toward the car salesman (can I help it if I like to make friends with everyone?) and disagreeing on how many seats we actually need in the van (Larry says 8, I say 7 because Theo is almost out of here) and holding spirited conversations about whether the Smith's light green Sienna is pretty or a color you wouldn't be caught dead driving in, it's a miracle we're even speaking to each other anymore. Anna is angry at me. I knew you'd be surprised. Suffice it to say, it was necessary this evening to reiterate the basic tenets of personal responsibility and how it's not all about her. Anna regarded this mini-lecture as an unpleasant experience best to be ignored, especially as the information was coming from a person who is obviously a loser; in fact, enough of a loser to have spent the past 15 years or so raising her when she would have been perfectly fine on her own. Have you checked out The Women's Colony yet? Why not? The garage called; they want 4000 dollars to fix the '96 Odyssey. Are those your boots? Can I put them away? Should we buy new or used? I didn't know we had any money. Did you make the decaf coffee? The Smiths got a Sienna, Greg said. His wife told him to. Can't you get the kids out of here? Let's review our personal stimulus package, folks: new brake rotors, impending new furnace, computer repair, a laptop computer, a truckload of topsoil, and (any minute now) a new stove to replace our 26-year-old kitchen range whose burners heat up when they darn well want to...all in the interest of helping out our moribund economy. You would think that would be enough, wouldn't you? But, no - the Dow is still floundering and unemployment rates continue to rise. Without our help, the entire country could sink into a morass so deep it will make the Depression look like a cakewalk. Apparently, Larry and I are going to have to pull out all the stops and purchase a brand new car. I have 20 people coming over tomorrow for a curricula meeting. Believe it or not, this i s how homeschooling mothers have fun - we all get together and discuss the learning materials we use and get to see everyone else's fun learning toys. A big event, complete with snacks! If this doesn't sound fun to you, you probably shouldn't homeschool. It's that simple. 20 people, probably 20 cars - and not many parking spaces available in our townhouse lot. Most people will park on the road, saving those precious close-in spots for mothers with babies. Which is why it is hard to understand why my husband had a man with a dump truck deposit a full truckload of topsoil in two of the available spots yesterday. You know, for his ongoing alienate-the-neighbors backyard project? It was a lot of dirt. And most of it is still there. Of course, this behavior may be part of a pattern. I mean, remember the Pampered Chef party incident? I told Larry I'd be holding a Pampered Chef fundraiser that week and then I left the house for an hour or so to run some errands. By the time I came back, he had ripped up the entire kitchen floor, right down to the 25-year-old plywood subfloor that reeked of rot. I don't know what to think. Maybe he doesn't like my friends? Or perhaps he harbors some deep-seated animosity toward Pampered Chef cookware and also toward homeschooling materials? Those items do tend to cost money, and you know wives - they'll spend whatever you make. But, hey, aren't we worth it? I should be sleeping. I even fell asleep early (8:30!). Good thing - because at 10:30 Brian woke me up - he "felt funny." Now he's finally asleep on the couch (what was wrong? I'll never know) and I'm wide awake. It kills me sometimes, reading the blog of someone approximately my age who is freaking out because, oh my goodness, she got woken up by some noise the previous night and didn't get her usual 8-10 hours of sleep. Doesn't she understand that over the past 18 years, I've turned sleeplessness into a varsity sport? Tha t there were chunks and chunks of time when, if I managed to get 3 hours in a row of sleep, I was good to go? And if I managed to sleep 5 hours, well! Look out, world, here I come! What were these people doing the past 2 decades with all that rest? They weren't staggering around sleep-deprived, their entire beings focused on when to grab the next 15-minute nap. Why didn't they manage to find the cure for cancer or something? And now? Now, when I do actually (sometimes) get 6 whole hours in a row? That is, when there's no teen to pick up late in the evening and no young one waking me up at 3 AM with a bad dream? It's not enough. My body will never catch up on all that sleep it missed, and it's pissed off. I am in a permanently unrested state. Yeah, go ahead and hate me. I'm paying now. I drag myself out of bed at 7:30, whining and moaning. If I attempt to sleep in past 8 (! ), I feel more tired. Going to bed early so I'll feel rested? Dream on! (pun fully intended) Something like tonight happens. Or, worse, I wake up at midnight, unable to get back to sleep. I've spent the better part of the past 20 years imagining a life where I wake up rested after a good night's sleep, but it remains a chimera. Or a mirage. Or whatever the right word is - what, you want me to be articulate after all these years of running on empty? Hmm...maybe I need Geritol. What was in that stuff, anyway? Monday night, I wandered into the kitchen, intent on getting a drink of water and then settling down for a nice half hour of pre-bedtime knitting. Reality - in the form of a sinkful of dirty dishes - smacked me in the face. I had forgotten that I promised my husband (who had had a bad day) I would do those after Bunko (yes, sometimes I do do some work around here). Keep in mind that it was 11 PM, and I had just kicked Anna off the computer (after her earned 20 minutes of Facebook) so she would get to bed at a decent hour. Because, you see, I am a good, conscientious parent, who wouldn't dream of letting her daughter stay up too late socializing via the Internet. Anyway, Anna came into the kitchen and suddenly I had an idea. An awful idea. A terrible, awful idea. An idea, I must admit, which I did not even hesitate to act upon. "Oh! Sure! Yeah!" she said, and then, more guardedly, "What do I have to do?" I didn't know anyone could do dishes that fast. And I'm thinking that this business of using Facebook as a carrot to dangle in front of my teen daughter is somewhat of a slippery slope. How long before I'm sitting around all day doing nothing but knitting and blogging while she scurries around earning Facebook minutes? Then again, what's so bad about that? Our personal stimulus plan continues unabated, with an expensive computer repair for a virus that slipped through all of Larry's safeguards. The stimulus effect was magnified by our purchasing a $350 laptop to tide us over while the computer was in the shop. Regular readers may recall a backyard construction project started last spring; you know, the one which involved a mud pit large enough to lose the neighbor's twin boys in. "Started" is the key word here. 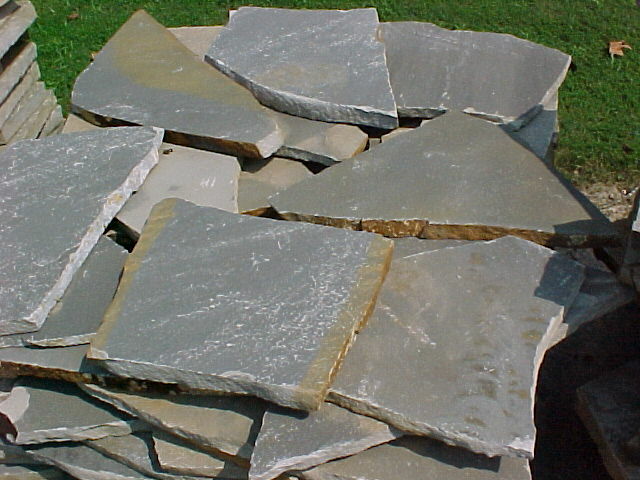 We left off somewhere in the middle, with large pieces of flagstone scattered in and around our property, leaving several dog-walking neighbors more than a little perturbed by the unsightliness and inconvenience of it all. 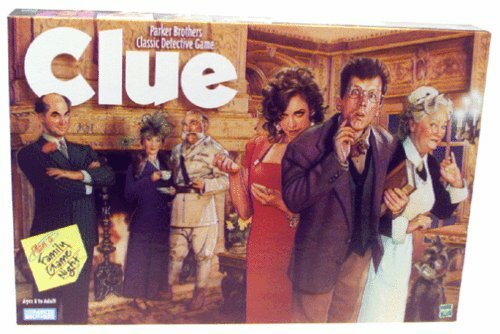 I must say, our lack of stick-to-it-iveness seems to have cemented our position as the neighbors from hell. Knitting isn't just a hobby, you know; it can also be educational. Why, just this evening I learned (after much trial and error and cursing) that 34 plus 34 plus 86 does not, in fact, add up to 160. I think I know why it's called the Baby Surprise Jacket: it will be a big surprise if I ever manage to get past the second row. Octamom asks today, "What inspires you to blog?" Well, the episode recounted above is a good example. If I had not been able to hope that my wasting an entire hour counting to 160 would make another knitter (or two, or three) laugh (at me, with me, who cares? 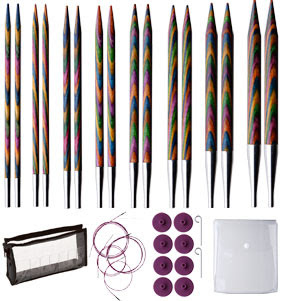 ), I might have impaled myself on my (surprisingly sharp) size 5 Harmony needles. Instead, I lived to discover that 34 plus 34 plus 86 plus 3 (sk2p) plus 3 (sk2p) equals 160. And then? I went to bed. At half-past midnight. Larry: Well, the computer's fixed; but we can't recover the files from your account. Good thing I saved them all onto this thumb drive! Larry: Weren't they in your folder? Me: No. They're jpegs, not documents. Me: The computer puts them somewhere. I didn't know I was supposed to move them. Me: You're kidding, right? Right? Me: Last time I saw it, it was on the counter. Larry: It's not there. Yours is there. Me: Oh. Well, you must have put it somewhere. Larry: Forget it - I'll just call the number. Me: You mean you don't know your own number? Sheesh. Here, I'll call. Larry: How am I supposed to keep track of all these numbers? Me: Well, why am I the one who keeps track of everything around here? It's not my job to find your phone! Well, my Knitpicks order arrived (oh, joy!) and Larry attempted to de-activate my credit card while saying things like, "I was wondering why you didn't go to the commissary this week." He exaggerates - the cupboard isn't that bare. 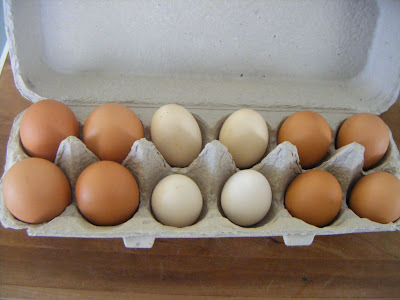 Why, we have old eggs, don't we? And why should I waste good money on food when no one even appreciates it around here? At least I appreciate the knitting supplies, right? Of course, I'm right. Don't even answer that. My hypochondria has been getting a workout lately. First there is this article about a freaky incident of toe amputation - and guess who has a pinky toe with a strange callous (sp?) causing a bit of pain, just like in the article? It figures. Then there are my ongoing spasmodic chest pains that are supposedly non-cardiac in nature, but my tendency toward melodrama won't let me believe that. Oh, and don't forget my deep-seated conviction that one day I will be felled by deep-vein thrombosis, because that particular condition has no symptoms whatsoever. Yup, he has it, too. And, of course, his twin brother. The kids my children play with all the time and who are welcome in our house at any time because they all stay so happy playing together, which leaves me lots of time to blog. Excuse me, I need a drink. Okay, I'm back. So, my friend called the school this morning to inform the school nurse of the situation. She was told that her daughter could be in class today. Apparently, we have one of the school systems stupid enough to abandon its no-nits policy. Please - just shoot me now. Well! Who knew that so many people would share the floating egg trick with me in the comments to yesterday's post? The kids and I put the eggs in a pot of water today and they didn't float. So I hard-boiled the eggs and fed them to the kids for lunch. No one died. We hosted clubs this afternoon. That means, my house is clean and my children are traumatized by our typical crisis cleaning this morning. I guess I shouldn't have threatened to throw out all their possessions, but I was feeling desperate. The threat of public shaming will do that to you, you know. 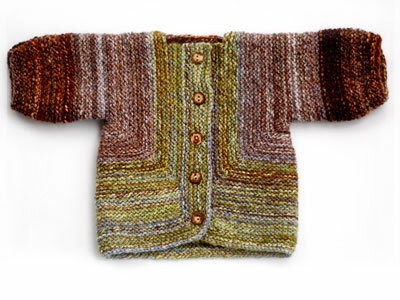 I am anxiously awaiting my Knitpicks order...you see, my top-down baby sweater has remained unfinished because I have not been able to locate the four size-2 DPN's required to knit the sleeves. I didn't want to order new ones, because I managed to find 2 of the needed needles; meaning, the other 2 are around here somewhere. The weekly fridge post has to wait - I took the pictures, and then I realized that my photo program is loaded on the computer that is in the shop. I don't want to risk overwhelming our new little laptop here with that stuff. But I do have a food-storage-related question for all of you: today I found a dozen eggs whose carton's "sell by" date is 19 February (of this year, wise guys). So - do I cook them or throw them? The font suddenly got larger while I typed - I don't know why. Magic, maybe? I went to Knit Night tonight for the first time in months. My best friend (who has 5 kids) reports that last week someone new showed up -a child psychologist who happens not to have any children of her own. So my friend said to her (and this is why she is my best friend), "You have got to be kidding me!" Being from New York, she can get away with this sort of behavior. I envy her. Why am I telling this story? I don't know. Hmmm....there's nothing funny going on here. I'm grasping at straws. And Anna is breathing down my neck, waiting for her turn so she can use Facebook. I love that Anna has Facebook. She did the dishes and wiped down the bathroom, all without complaining, just so she could get her fix. If she had to choose between Facebook and oxygen, she'd hold her breath. Um...is it my imagination or is the world sort of falling apart? And will buying more Girl Scout cookies fix it? At least, temporarily? After 10 years of trying, tonight at yoga I managed to stand on my head without using the wall for support. Who says middle age isn't exciting? Anna's being nice to me again. Something's up. Nothing in life is free. A friend and I took our kids to ChickFilA for lunch today. Rachel came out of the play area to inform me that someone had peed at the top of the climbing equipment. And guess what? It wasn't Susie! The comments on my Love Story post from 2 days ago have opened my eyes to just how strongly we women feel about our household gadgets. My confession of infatuation with a French-door fridge (ooh-la-la!) produced an outpouring of passion about the sleekness, the usefulness, and (yes) even the betrayals (who knew that stainless steel was so hard to keep clean?) of assorted household appliances. One anonymous commenter went so far as to call me a hussy for coveting what she claims is her one true love. Ladies! Let's be civilized here. We can share. Anna took to her bed after being forced by her cruel father to clear the snow off the windshield of our minivan. Larry was lucky enough to witness the one-armed imbecile routine himself, and he was not amused. Rachel screamed for half an hour (no lie) over a paper cut. I am not going to be there for her when she gives birth, I can tell you that right now. I felt it necessary to go outside and explain to our very nice neighbor (who was shoveling his front steps) that I was not, in fact, beating the poor child to death. I don't know if he believed me, however. It snowed last night and today. A real snow that accumulated enough to cover the grass - the first time this winter, in fact. Naturally, we spent the day reveling in it. Thank you, Mother Nature! But, um, you can stop now. Really. We're done. Full steam ahead for spring! Easter and bunnies and jelly beans and Cadbury eggs, all right? Yum. Oh, and Brian managed to make a little money shoveling a neighbor woman's front steps and walk. Susie "helped" him out with her little shovel for a bit, but she soon lost interest and wandered away. Brian stayed the course and left clutching his pay, dreams of new Legos dancing in his head. A few minutes later, Susie knocked at my neighbor's door. "I want a dollar!" she announced. What a great way to get money - just ask for it. I think she's on to something there. Does wearing a girdle every day help shrink waist? Unfortunately, not everyone enjoyed it as much as I did. Apparently Salman Rushdie is shocked, shocked, that a hit movie had an unrealistic plot. I can't imagine how disgusted he felt after the original Die Hard. Has he even seen Sound of Music....Casablanca....Mary Poppins....? Maybe he just doesn't get out to the movies much. Hear ye! Hear ye! Let it now be a matter of public record that my teen daughter Anna (aka What-Have-You-Done-For-Me-Lately) was graciously allowed to attend the movie Shopaholic yesterday with her friend. She apparently doesn't remember, judging from the way she shlumped around today because she didn't have a ride to the mall and her inconsiderate parents expressed an unseeming reluctance to brave near-blizzard conditions to drive her to youth group. Yeah, the attitude bugs me. How could you tell? I am laboriously typing this on a laptop, a device I have never used before. Strange things keep happening while I attempt to manipulate the mousepad (or whatever you call that thing) - fonts get larger and smaller, strange boxes appear onscreen, cursors disappear. We bought the laptop on clearance because our one-year-old computer is in the shop, and we are not going to go through the charade of trying to manage without a computer for over 3 days. We barely made it 10 minutes, in fact. Anna had to call a friend to find out movie times. It's here! The Women's Colony has been launched! Three cheers for Mrs. G! Don't miss the orientation - hurry on over there!